The Moldanubian Zone (MZ) was considered for many decades as an old nucleus (median mass) of the Bohemian Massif consolidated during the Cadomian or older orogenies, and surrounded by mobile Variscan belts (Stille 1951; Máška and Zoubek 1961; Zoubek et al. 1988; Chaloupský 1989). However, numrous investigations carried out in different parts of the MZ in Czechoslovakia, Austria, and Germany over the past 20 years have confirmed the early suggestions by Suess (1912, 1926), Kossmat (1927), and Kober (1938), who first interpreted the structural evolution of the MZ in terms of Variscan horizontal tectonics. 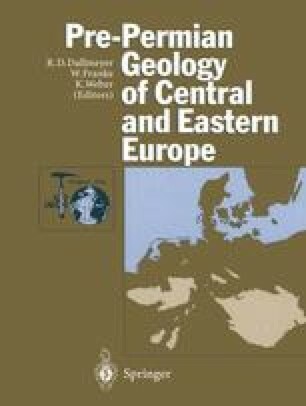 There is a growing body of evidence indicating that the Moldanubian segment of the Bohemian Massif represents a mosaic of tectonic units with a distinct tectonometamorphic history which were finally assembled in the course of the Upper Paleozoic collision of Laurasia and Gondwana.